Alter Ego Productions is a U.A.E. based animation and media company that is forging a new identity for anime in the middle east, with their first original production Torkaizer. Alter Ego also has plans to launch an original Manga series, Solomon’s Knights which will take inspiration from Arabic folklore to cast its heroes against an army of evil Djinn. The CEO and founder of Alter Ego productions, Ahmed Al Mutawa, was kind enough to give me some of his time via email. We discuss the origins of his own fascination with anime and the state of anime and Japanese culture in the Arab world in general. Mostly we talk about Giant Robots! Gabe: What was the impetus for the creation of Torkaizer? How did the team at Alter Ego come together? Ahmed: Haha, now that's a long story, but I'll try to keep it short. Back in 2011, I woke up one day thinking to myself: "I wanna get into flash animation!" So I bought a couple of books to teach myself flash animation. I've always wanted to entertain people with crazy stories, but I have ZERO art skills to draw comics. So I figured since I'm not an artist, at least I can scribble some hideous characters and focus on the animation side of things. In order to practice what I've learned, I had to create a makeshift 5-minute story. It had to be funny and short. A joke. The most famous anime in the Middle East is "UFO Robo Grendizer". To this day, I've never seen an Arab who doesn't know what Grendizer is. Since we have a special place for Grendizer in our hearts, I thought it would be nice to have a giant robot flash animation, but I wanted it to be different. I wanted it to be a parody of some sort. I wanted to make a giant robot story featuring a very stereotypical Arab protagonist screwing up everything. In this side of the world, a stereotypical Arab is usually viewed as lazy, self-centered, and unskilled, and this sounded like the perfect blend for a giant robot pilot fighting a battle that's not meant to be his. A stereotypical Arab otaku going to Japan on vacation who ends up piloting a giant robot and complaining about it the whole time because it's not even his fight to begin with! That sounded like a great plan at the time. But then things started to change. The more I wrote, the more ideas I got. What started as a script for a 5-minute flash animation became 10 minutes, then 20 minutes, then 5 episodes then 10 episodes and I thought "ok, I'm onto something here this can potentially become a full series" Then it hit me! So many arab shows and cartoons that have been airing on TV always portray Arabs as lazy, stupid, self-centered, unskilled, etc and that's how the stereotype was formed. I wanted to do something different. I wanted to give kids and young adults a more positive role model a brave Arab protagonist who may be lazy and unskilled, but has a very pure heart that's full of courage and the willpower to protect other people even if the fight doesn't concern him. The story will still maintain its identity as a comedic action series loaded with homage, easter eggs and parodies, and it'll make fun of a lot of typical giant robot anime tropes, but the protagonist's personality will develop into a more serious one as the story progresses. Even the name of the robot is a trope. A typical giant robot's name usually ends with "er" and I wanted to do the same thing, and that's how Torkaizer was born. The name itself comes from his core relying on Torque to build up energy, making him the "King of Torque", sooooooooooooo... TORKAIZER!! A 26 episode anime was born, except I'm just one guy who can't even draw and I don't have enough money to produce a single episode in Japan. Fast forward to the end of 2012, I started my company Alter Ego and recruited a small team of talented artists and animators to build the concept further. We released a teaser and a trailer in 2013, and debuted the pilot episode on April 2014, which was watched by thousands of people in various private screenings and showed a satisfaction rate of over 99%. We're currently seeking funds to produce the whole series, and this is by far the toughest step of the project. Gabe: What mecha or giant robot anime are your biggest influences? Ahmed: Definitely Gurren Lagann. It always was, is, and will be my absolute favorite anime. Gabe: The main character is himself an Otaku, and the plot involves a trip to Akihabara. Have you or your team had the opportunity to visit and what impact did it have on you? Ahmed: Yup! I go to Japan at least twice a year. And it's been like that since 2009. I still remember my first visit and how I was dying to see Akihabara. 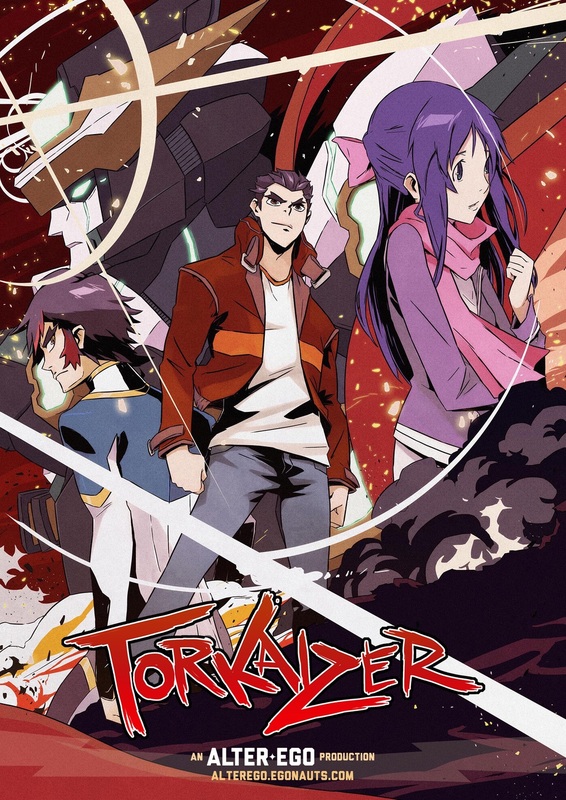 This is the case with every anime fan out there regardless of nationality, and I wanted to reflect that feeling in Torkaizer to give the audience that feeling of connection with the protagonist. During the development of the pilot episode, a couple of us walked around Akihabara with a camera to find the best locations for backgrounds and fight scenes. We wanted to accurately recreate Akihabara so our fans would visit the fight locations in real life and go like "that's where Torkaizer crashed!!" or something. Of course you can imagine how awkward a situation can get when it's taken out of context. How would you react when you're minding your own business in Akihabara, when suddenly you see a couple of arabs with a camera, recording their surroundings then pointing at a building and saying "that's where we're gonna make it (the alien robot) crash! Man it's gonna be an epic explosion that'll tear the whole building down!!" We turned around and found so many people gathered around us and whispering stuff to each other while giving us the stink eye. We had to explain that we're planning a fight scene for an anime, not a terror attack, and it was HILARIOUS. Gabe: How were you introduced to Japanese pop culture? Ahmed: Dubbed anime has been airing in the Middle East since the early 80s, if not the late 70s. So we all grew up with it. However I truly got into it back when I was 9 years old (1992). I used to buy a lot of anime on VHS, in fact, I did most of my shopping in London, which was my family's no.1 destination for summer vacations back then. Gabe: How popular is Anime/manga in the U.A.E? Ahmed: Really popular, especially after the year 2000 with the introduction of high speed internet. People started downloading anime and it became very popular between college students. It's quite unfortunate to see anime being introduced through piracy like this, but it's only because Japan has no interest in entering the Middle East market for animation. And to this day, the Middle East remains an untapped market. I'm working really hard to change that! Gabe: Are there plans for a release of Torkaizer in the west and in Japan? Ahmed: Definitely. In fact, Torkaizer has a lot of western and Japanese characters, and they'll all be speaking in their own languages. Having multiple languages in the show is a good way to introduce language and cultural barriers that the characters have to overcome in their fight against one common threat: the alien invaders. We're most likely going to fully localize and dub the series in English and Japanese too. Gabe: Do you have any other projects on the drawing board? Ahmed: Yes. We're working on a project in parallel with Torkaizer. It's a manga called Solomon's Knights, an action packed supernatural adventure that follows the story of a kid named Salem who teams up with a djinn to stop an impending invasion of a djinn army ready to slaughter every human being in existence. The concept is an urban retelling of arabic horror stories, mythology, folklore, etc. We released a test chapter in 2014 which built a lot of hype, so we're working on volume 1 as we speak, which will be released in English and Arabic.